We’ve been having fun playing with the magnetic haiku set the Haiku Buckaroo won over at My Mommy’s Place. I thought you might enjoy an occasional selection from the fridge. This one’s appropriate for an evening benediction. Yea! I won a prize, people. Ok, it was random, but it’s still a really great prize (a matted photo of Allison’s). And I got an honorable mention. And my honey is the haiku buckaroo! Go congratulate him and go check out the other winners. I thought everyone did a great job on this contest. 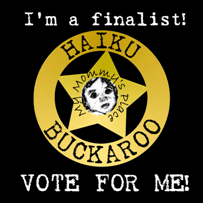 Go enjoy the great haiku, and cast your vote for your faves.